Australia began producing the Lunar gold coins series in 1996 with the design of "Year of the Rat". For 2006 the Australia (Perth Mint) government is issuing the "Year of the DOG design, coinciding with the Chinese lunar calendar animal. One side of the coin displays a beagle dog. The other side has a portrait of Queen Elizabeth. Each year, for 12 years, the Australian government mint (at Perth Australia) will produce gold commemorative coins celebrating the famous Chinese Calendar lunar designs. The animal design will change each year. Each of these gold coins is 99.9% pure solid gold. For more information on the Lunar gold series, click here. Silver Dog coins are also available in this series and feature a different dog, the German shepherd. See the ancient Chinese Lunar-Zodiac calendar . 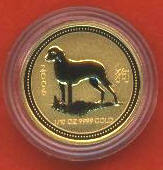 The 2006 Year of the Dog gold coin features a Beagle hound. 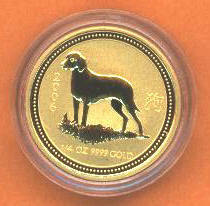 This small 1/20th oz gold DOG coin is made of SOLID GOLD, like the KANGAROO , lunar SNAKE , and TIGER gold coins! Produced by the Australian government at their Perth mint. Celebrates the Chinese lunar calendar animal for 2006. Comes in a plastic capsule - Nice Brilliant uncirculated proof like condition. Click for more details and mintages. Small - about 14mm in diameter. Solid gold coin from Australia. Nice Brilliant uncirculated proof like condition 1/10 ounce gold coin. Features a Beagle hound design. Only 12,017 of these tenth oz dog coins were minted. 16mm in diameter (almost the size of a US dime). 1/4 ounce of pure gold lunar series coin. Year of the Dog lunar series design. Nice Brilliant uncirculated proof- like condition. Features a Beagle hound design. PAYPAL to pay with your Visa or Master Card. You may also email us your order. We accept money orders, cashiers check, or personal checks as payment. Thanks! ( c ) 2004 J Ly n n a n d C O . . . . . . . .